Have you ever wondered about the health of a stream? Is it safe to swim in or eat fish from a particular body of water? 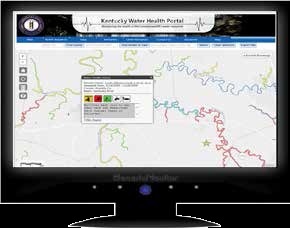 The new Water Health Portal provides answers to those questions. The Kentucky Division of Water encourages Kentuckians during National Drinking Water Week, May 5-11, to practice water conservation every day of the year. Heating water can be a significant part of your home’s energy bill. Basic maintenance of your water heater, however, will improve its efficiency while saving money and resources. The Kentucky Division of Water offers these energy-saving strategies to reduce your costs and save water. Conserve hot water by fixing leaks. If your water heater is leaking, you need to replace it. Choose an energy-efficient model. Perform the routine maintenance outlined for your particular water heater. Install heat traps on your water heater tank to prevent hot water from flowing out of your tank. Fall is the best time of year to fertilize your lawn and control weeds. In fact, healthy lawns help area lakes and streams. Thick grass prevents soil erosion and absorbs rainwater. By soaking up rainwater, lawns decrease the amount of stormwater runoff funneling pollutants into lakes and streams. The Kentucky Division of Water offers some tips on getting your lawn “eco-ready” for the coming months. Mow. Mow your grass at a height of 2½ to 3 inches. Water.Even though it is cooler in the fall, lawns still need regular watering to maintain plant health and better survive winter conditions. Water until the ground begins to freeze. Fertilize. Mid-to-late October is the best time of year to fertilize your lawn. Fertilizer provides grass with nutrients for spring growth. Use zero phosphorous lawn fertilizer unless you are establishing a new lawn or you have a soil test that indicates additional phosphorus is needed. Look for a middle number of “0” for NPK on the fertilizer package. Water your lawn for one to two hours after fertilizer application. Control Weeds.September is the best time of year to treat dandelions, plantain, clover and creeping charlie. Limited numbers of weeds should be removed by hand or spot-treated with herbicide. The Kentucky Division of Water is encouraging citizens to learn how they can conserve water during drought and year-round with some simple changes in their water-use habits.